In the meantime, here’s an article that was published last month in 48North about our decision to give Halcyon a shiny new beating heart. We were motoring across glassy seas off the coast of southern Mexico, somewhere between Zihuantanejo and Huatulco, when our engine abruptly sputtered to silence for the first time, without announcement or ceremony. What followed was one of our most challenging passages to date, as we battled a suddenly disloyal engine along with gusty winds, rocky lee shores, and lines tangled in our propeller. My relationship with cruising changed that day, about the time the engine quit for the fourth time in as many hours. Before that moment, while we had seen big seas and strong winds, unpredictable storms and uncomfortable anchorages, Halcyon had always been the strong one. She took care of us, no matter the condition. After that moment, my confidence in her strength waivered. The issue that day was with the fuel system; the engine itself was not broken. But the trauma it caused stayed with me and modified my cruising mentality. Every passage after that was rife with anxiety. Each tiny pitch change in the engine sent my stomach into my throat with fear that it would die again. And it often did. Entering a marina, I prepared our lines and fenders early then stood on the bow with my hand on the anchor windlass, just in case the engine decided to quit too close to the breakwater. When we purchased Halcyon in 2011, several trusted friends advised that we would need to replace the engine “soon.” The boat still chugged along with the original Westerbeke 4-107, installed when the boat was built in 1976. That old diesel was strong and had been maintained well. It was hard to fathom such a huge expense to replace something that worked just fine. So, we kept up on the maintenance and never had an issue. With that old chugging heart, Halcyon carried us all over the Puget Sound, up the inside passage to Alaska, down the coast of the US and all through Mexico. But then she faltered. The transmission died as we pulled in to Zihuantanejo (just a week before that first engine sputter). Later, the transmission oil cooler failed and started to leak sea water into our recently rebuilt transmission. Several of our injectors leaked and the gasket in the exhaust manifold had to be replaced. The tachometer required a good solid kick to get started and the main seal perpetually oozed oil, transforming the floor of the engine room into one big oil slick. I was starting to see the writing on the wall. The core engine functionality was still intact, but I worried what would fail next. While one can argue that a well-maintained diesel will run forever, I was nervous our engine trouble was going to escalate just as we were traveling further and further from civilization. With plans to cross the Pacific this season and spend a few years exploring the remote islands of the South Pacific, it was finally time to give Halcyon a new heart. We do not take these decisions lightly. Buying a new engine would take a significant bite out of our cruising budget, and the project would be seriously time-consuming. But we knew it was the right decision to make, and once committed we did not look back. After many hours researching various options, we decided to order a Beta 50. Beta is the new kid on the block, but they are gaining a lot of traction among cruisers. Their engines are simple, without the added complexity of computerized systems found on many modern engines. Because the Beta is a marinized Kubota block, parts are often easy to find at Kubota tractor shops, and at tractor prices! Beta is also known for their flexibility in engine build. We were able to keep our transmission, along with the v-drive, shaft and propeller, which saves us both money and hassle. When we told the sales rep that we had a v-drive, he altered the order to put the oil sump pump on the opposite side – the accessible side for us (the v-drive positions the engine “backwards” in our boat). The maintenance items are easy to access and the engine has a built-in oil sump to make oil changes quick and easy. I know I sound like a Beta sales rep. They did not pay me to say those nice things (in fact, I paid them – a lot), I am just excited (and nervous) about how Halcyon’s transplant will go. We have decided to do the installation while Halcyon is in the water at Vista Mar Marina, and will do the bulk of the work ourselves. Because we are keeping our transmission, v-drive, shaft and propeller, a haul out is not required. While the new engine is snug in its crate bobbing across the Atlantic on a container ship, we have been busy dismantling and removing the old engine and scrubbing and painting the engine room. 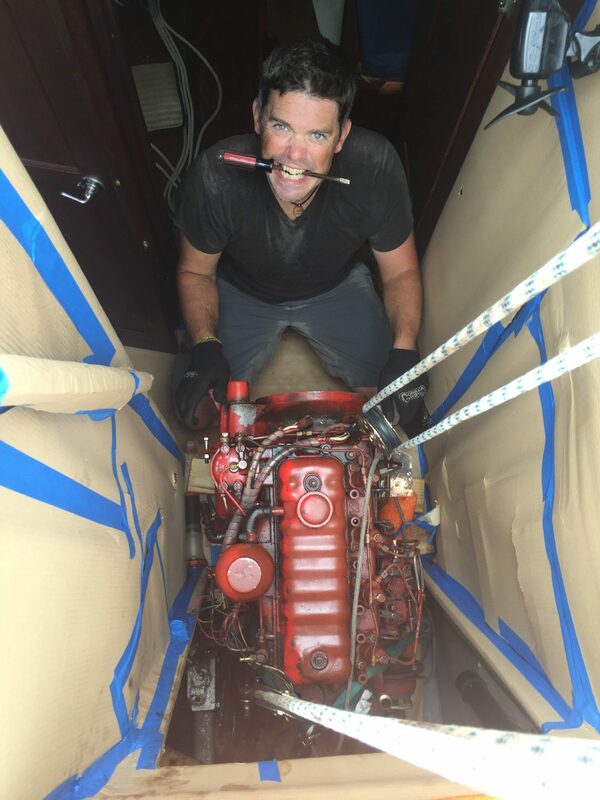 It was a relief to discover that the engine block, once stripped of all its jewelry, fit through the engine room door and companionway without needing to demolish any walls. We have an agent ready to shuffle the incoming crate through customs and immigration, and a mechanic on call to help with alignment and anything else if we run in to trouble. Deciding to undergo this momentous and expensive project was not easy. It’s hard to stay cramped into our little engine room huffing paint fumes while our friends are out exploring the islands of western Panama. But I know the benefits will be worth it. I am excited to peer into a shiny clean engine room, to stop mopping up a perpetual oil slick, and to get through oil changes without cursing (much). Most of all, I am excited to once again trust our old girl to carry us safely, so we can sail to those idyllic cruising grounds, the ones with crystal clear anchorages next to uninhabited islands dotted with swaying palm trees and surrounded by colorful coral reefs. Hurry up, engine! Boat work! We do a lot of it! Another great story, Becca! Bravo to you two intrepid sailors. And thank you for loving Halcyon (our first child) the way you do! !